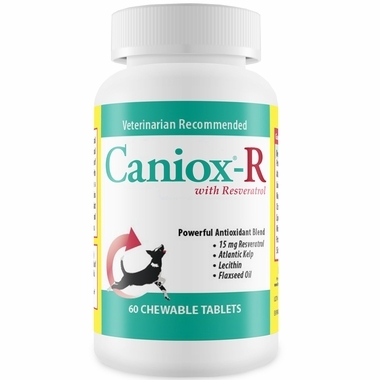 Caniox-R is a potent all-natural antioxidant blend nutritional supplement for dogs. Caniox-R provides dogs with essential nutrients to promote a healthy and extended life. Contains Resveratrol, a powerful antioxidant believed to promote longevity and protection from age related diseases. Potent Natural Blend Also Includes: Atlantic Kelp, Flaxseed Oil, Grape Juice Powder, Grape Seed Extract, Manganese Ascorbate, Vitamin E, Citrus Bioflavonoids, Lecithin, Alpha Lipoic Acid, Dicalcium Phosphate, Microcrystalline Cellulose, Sucrose, Porcine Liver Powder, Stearic Acid, Silicon Dioxide, Magnesium Stearate.